Keeps your eyes clear of unwanted bacteria! Our Contact Lens Case with Mirror is a very handy dorm accessory for any college dorm dweller that wears contact lenses. This Contact Lens Case with Mirror comes with a typical contact case that is marked with "L" and "R" to signify left and right: the way most people distinguish their contacts. However, our Contact Lens Case with Mirror also comes with a case (to go around the contact case itself) that is waterproof and perfect for both dorm shower caddies and general on-the-go use. Best yet, our Contact Lens Case with Mirror comes with (yes, you guessed it!) a mirror! Many contact lens cases don't come with a mirror, yet mirrors are very beneficial to those who wear contacts and need to put them in when they're on-the-run. Dorm supplies that are multi-purpose are the best because you can use them even when you're not in the college dorm. 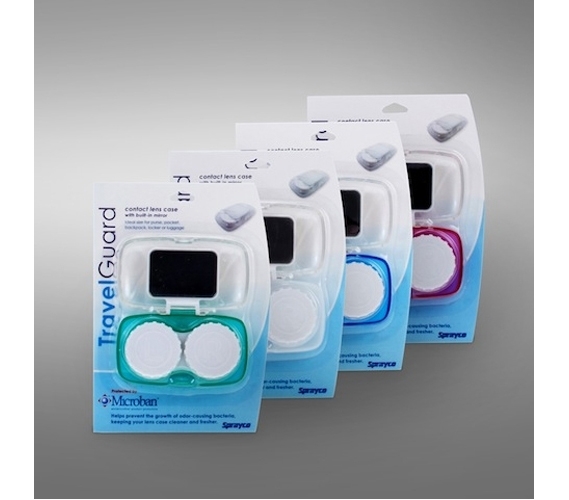 Beyond just the convenience of your dorm room and dorm shower caddy, our Contact Lens Case with Mirror is the ideal size for a pocket, purse, backpack, or luggage as well. Due to its versatility, you will be able to use this dorm accessory time and time again!